If there is one thing we’ve learned attempting over 6,800 fixes together – it is that products are only getting less repairable. Problems with the electronics and appliances are endemic, and industry is increasingly taking away our right to repair products, let alone making better products. We’re tired of the “take, make and dispose” economy, and there is a role for regulation. Enter Europe. The Circular Economy Package promises environmental product standards that make electronics and appliances last for longer, and make them more repairable. But we need to keep the pressure on. Last month, we pushed them to include mobiles in their plans. And now Europe wants our input on our experiences with home appliances, screens and computers. With so many unknowns related to Brexit, European product standards are the best chance we have for better products. Make your voice heard, take 10-15 minutes. Skip the parts you do not know about. If you are a Restarter or a DIY repairer, please include your comments and experience in the free text areas. Please do this by 7th May, that’s one week from today. 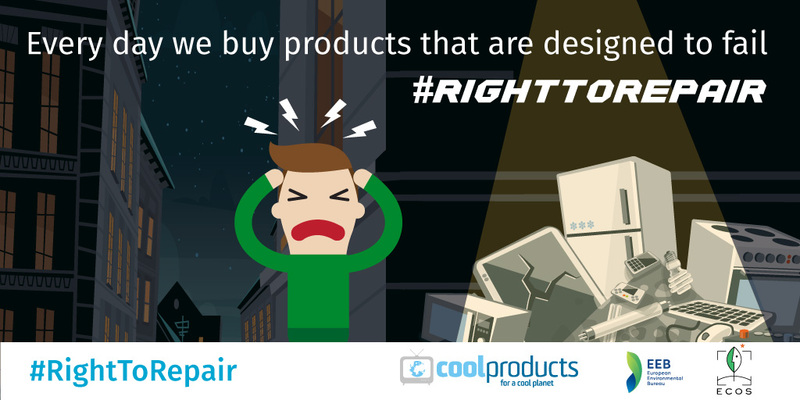 Learn more from Cool Products, who is leading the way in Brussels on this. Done. It was interesting to be able to suggest that washing machines should have a noise rating as well as energy ratings. I bought a machine recently A++ energy rating that whines so loud it can be heard throughout the house. It also is unsuitable for Most UK floors as it vibrates tremendously when spinning. We support a network of community repair initiatives active across Europe and beyond. The success and popularity of these activities confirms that product repairability, durability and upgradability are important, often neglected aspect of eco-design. The current review of Ecodesign and Energy Labelling policies is a crucial opportunity for the EU to positively respond to citizens’ discontent with current barriers to repair. The measures we suggest will benefit community repair groups and independent repair businesses alike. Manufacturers should be required to provide complete repair information and instructions for all their products, so that independent repairers as well as community repair groups can perform repairs and prevent unnecessary waste. This will also allow consumers to verify whether a product is repairable before purchasing it. Manufacturers should also extend the period for which they provide software updates, and be clear about the length of their commitment to releasing frequent security updates, so that products such as home appliances, computers and televisions can be upgraded rather than replaced with new ones. This is increasingly important at a time when all products are becoming connected to the Internet. Design requirements must ensure that key components of a product are easily accessible and can be replaced in case they break. Manufacturers should be required to make spare parts available to all at price points not undermining the viability of repair. Manufacturers should also be required to clearly state the length of their commitment to providing spare parts. With specific reference to computers, we have rated waterproofness as “important” in our answers to the questionnaire, however this should not compromise their ease of repair and upgradability. Where waterproofing compromises ease of repairs, manufacturers should be required to inform consumers.